Sarah has been selected to the The National Trial Lawyers: Top 40 under 40. This is a professional organization composed of the top trial lawyers from each state or region who are under the age of 40. Membership in The National Trial Lawyers: Top 40 under 40 is by invitation only and is extended exclusively to those trial lawyers practicing civil plaintiff and/or criminal defense law. 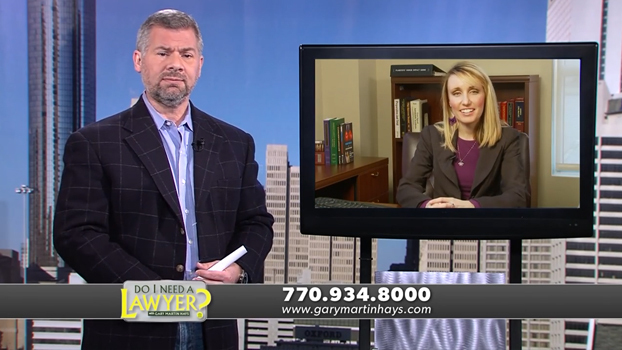 In this segment of Do I Need a Lawyer, Gary Martin Hays and Sarah R. Low discuss diminished value claims as well as punitive damages for property damage. After a few years of representing clients in these crucial times, she felt compelled to take her passions for people and law and combine them to represent those injured as a result of the negligence of others. This desire led Sarah to Gary Martin Hays and Associates. Sarah has since been featured on the CW Atlanta TV Network where her expertise was called upon to discuss legal topics and answer questions about personal injury law in Georgia. When not advocating for her clients, Sarah enjoys traveling, baking, exploring the outdoors and volunteering for her church and various other non-profit organizations. Sarah is a member of and the immediate past president of the Forsyth County Bar Association. She also served as treasurer and secretary prior to her presidency. Sarah is a member of the Georgia Bar Association. She is also a member of the 2018 Young Lawyers Division Leadership Academy for the State Bar of Georgia. The leadership academy is a highly selective program intended for attorneys "interested in developing their leadership skills as well as learning more about their profession, their communities and their state." Sarah is involved in a Leadership Development Program at her church and volunteers with the children's programs.